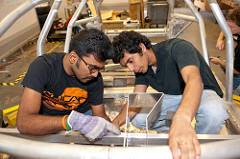 The Department of Automotive Engineering is part of Clemson University's College of Engineering, Computing and Applied Sciences. Currently, more than 200 students are pursuing graduate degrees in automotive engineering. Our diverse student body shares two things – a hunger for knowledge and a passion for the car. 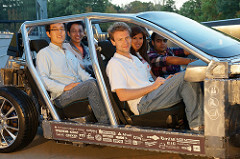 We are housed in the Carroll A. Campbell Jr. Graduate Engineering Center (CGEC) at the Clemson University’s International Center for Automotive Research (CU-ICAR) campus located in Greenville, South Carolina. CGEC is a state-of-the-art building equipped with full-scale vehicle testing equipment. Coupled with the services of our highly-skilled technical staff, the facilities are like a wonderland for bright, inquisitive students. Thanks to the work of our world-class faculty, our students learn in an innovative research-and-educational program that focuses on the vehicle and its infrastructure from a systems integration perspective. Our entire program is devoted to the discipline of automotive engineering. This focus sets us apart and gives our students remarkable opportunities. It’s one of the reasons that over 99 percent of alumni are using their degrees in either the automotive industry or academia. Please browse the site to learn more about our academic program, opportunities for students, unique location, and research.